It’s inevitable that we will run in to testing times at some point in life, whether that’s in health, relationships, work, finances, or something else. These cause us pain, but they can also cause us suffering. The primary pain is the actual event or illness or whatever it might be that has happened, or is happening, that we cannot change and is outside of our control. The secondary suffering is our reaction to the primary pain – the thoughts and feelings that come, and continue to come, sometimes long after the source of the primary pain has gone away. As bad as the primary pain might be, the secondary suffering (how we respond to it) can escalate things to a whole new level and has the potential to cause far more devastating and far-reaching effects than any primary pain the world can throw at us. Will I never be well again??? How will I cope with…??? 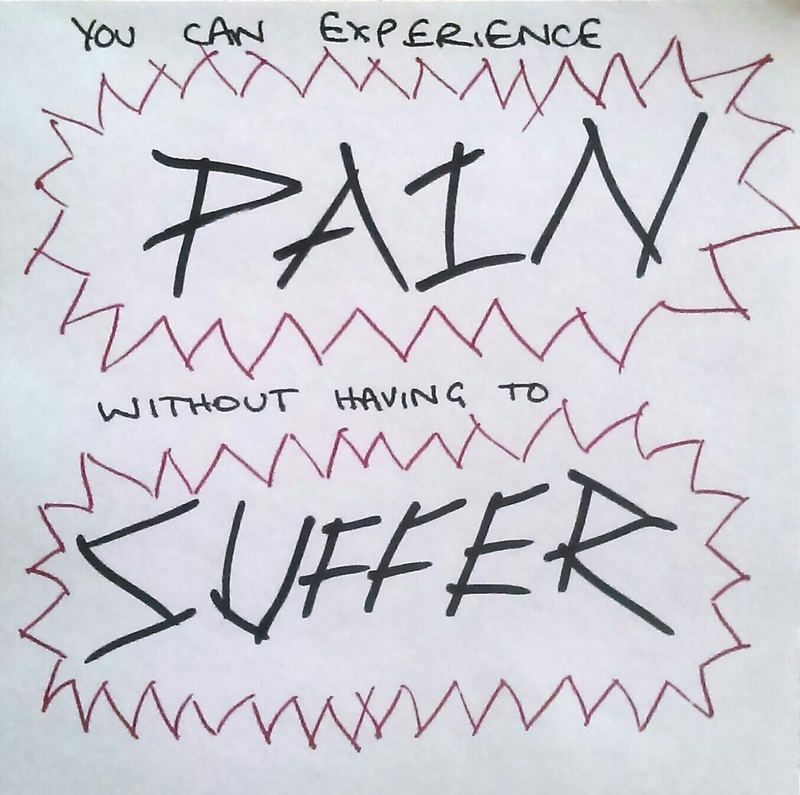 Once I learnt about primary pain and secondary suffering, I was able to start to separate them out a bit. Now when a bad migraine starts I can use mindfulness techniques to focus my attention on breathing and the actual sensations of pain in the present moment instead of the thoughts in my head, which I can save for another time when I’m in a better place to look at them. It frees me up to deal with just one thing at a time and means I don’t get so overwhelmed that I have a major meltdown on top of the migraine itself. At least that’s the theory – some days it works better than others! Secondary suffering is like a ravenous beast – it will eat everything we feed it and never get full. I know I sometimes treat the Secondary Suffering beast like it’s feeding time at the zoo, and I know it doesn’t bring me any benefits at all. Life gives us enough Primary Pain, without adding Secondary Suffering into the mix as well! There are some things you can change and some things you can’t. What we can’t change is the primary pain – the actual event or illness, etc. What we can change is our response to it – which can develop into secondary suffering if we’re not careful. The next time you experience pain or stress, take a moment to step back and observe your thoughts and feelings from a slight distance. What is the primary pain or issue and what is the secondary suffering your mind is creating in response to it? Every time you notice it, you can congratulate yourself on becoming a little bit more ‘mindfully aware’. This entry was posted in Mindful Mondays and tagged chronic illness, chronic migraine, migraine, mindfulness, pain management, primary pain, secondary suffering, spoonie, spoonielife, thinking errors. Bookmark the permalink. This is so helpful for me at the moment, Naomi, thank you! I am full of the critical self-talk and label making at the moment. It is good to see it labelled for what it is – crap that I need to be aware of and stop punishing myself with!